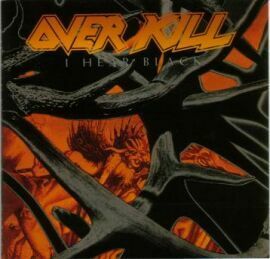 I Hear Black is the sixth studio album by thrash metal band Overkill in 1993 on Atlantic Records. It was the band's first to feature drummer Tim Mallare. Produced by Alex Perialas (Anthrax, Testament), I Hear Black was the first Overkill album released directly through Atlantic Records. The album once again presented a change in style for the band, from the up-tempo thrash of Horrorscope to a more doom metal style. The result was a metal album which had a much darker feel to it. A music video was shot for "Spiritual Void" but failed to receive substantial airplay. The European leg of the 1993 "World of Hurt Tour" featured Savatage as a support act. I Hear Black proved to be Overkill's most successful album to date, as it got their highest ever chart position, debuting at #122 on the Billboard 200 charts. This album and W.F.O. were re-released on Wounded Bird Records in 2005.